ARTREPUBLIC, THE destination for art online, are offering the chance to win this limited edition giclee by digital artist Billelis. "We've really upped the stakes to kick-start your 2016 - with this incredible giveaway from contemporary artist Billelis. 'Geometric Necrosis III' is a beautiful Giclee with silkscreen varnish on 300gsm minuet paper with semi-gloss and UV gloss varnish." 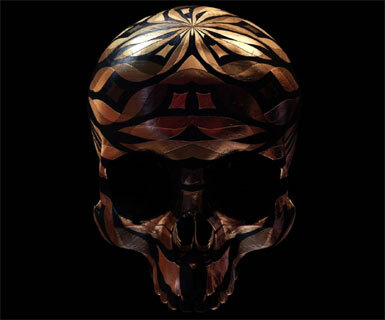 The piece is from a series of uniquely digitally sculpted skulls, featuring a dark texture base alongside bespoke gold debossing. Hebrew, Egyptian, Alien glyphs have all inspired the style and creation of the piece. This prize is signed and numbered by the artist – so to be in with a chance of winning, enter your details HERE. If you aren't feeling lucky you can buy Geometric Necrosis versions I through V online HERE, including his most recent work 'The Mistress' which I've been staring at for days now trying to find a way of raising the money to own one of the 25 editions.